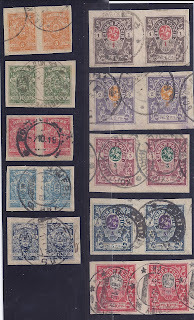 One of the most common catalogue errors is to value very old stamps on a New Issue basis. Low value stamps get low catalogue values and higher value stamps get higher ones. But this is often a very poor metric to use: in periods of inflation, for example, low value stamps have little postal utility and higher value stamps often get used in big multiples. This is true for several Russian Civil War issues, including the Denikin stamps of South Russia. Now, from experience, the 7 rouble is not a great rarity. It is simply missing from this old Lot - maybe it is in another cigar box. So I don't draw any conclusions from the fact there are no copies present. But look at the other figures. 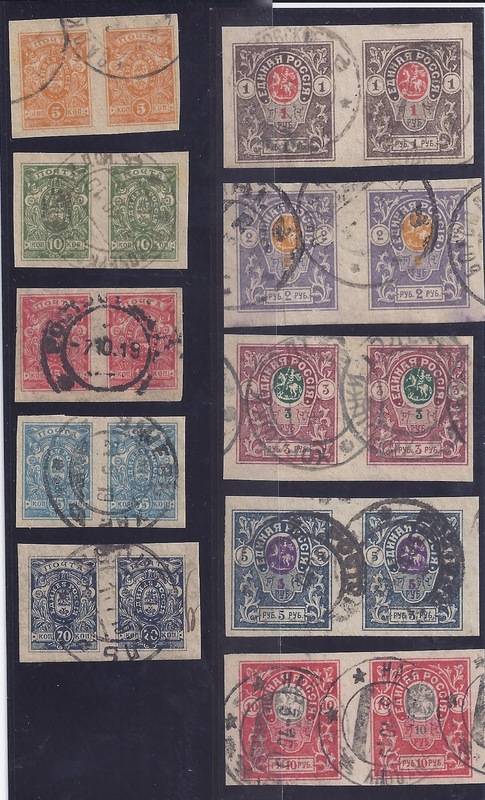 The concentration of 35 and 70 kop stamps reflects the fact that these were letter rates or the basis of letter rates ( 35 kop Ordinary / 70 kop Registered; later 70 kop and 1r 40 kop). The concentration of 10 rouble stamps reflects the fact that these were most needed for Money Transfer Forms and Parcel Cards. I have illustrated the Denikin stamps with horizontal pairs. But for rouble values, vertical pairs and strips are more common - the space on Money Transfer forms and Parcel Cards allowed for stamps is a vertical strip. In contrast, horizontal pairs of 35 kop and 70 kop are common - they were used as letter seals. Suppose I had the 7 rouble value. I estimate there would be 50 - 60 copies. So the constraint on making sets is provided by the 5 kopeck. I could only make 17 sets. (And the pair I have shown is the only pair I have ...) . A "Short Set" of used Denikins would exclude the 5 kop, not the 10 rouble! One further comment: ALL the stamps in the accumulation I have studied are used in the period of "White" control of South Russia and Ukraine. Later dates which would represent Soviet use appear not to be present. Such later use is most common on Parcel Cards. The low kopeck values would have been revalued x 100 in Spring 1920 and it may be that as a result the low values become more common in the Soviet period, but in my experience it is the higher values - especially the 10 rouble - which still dominate.